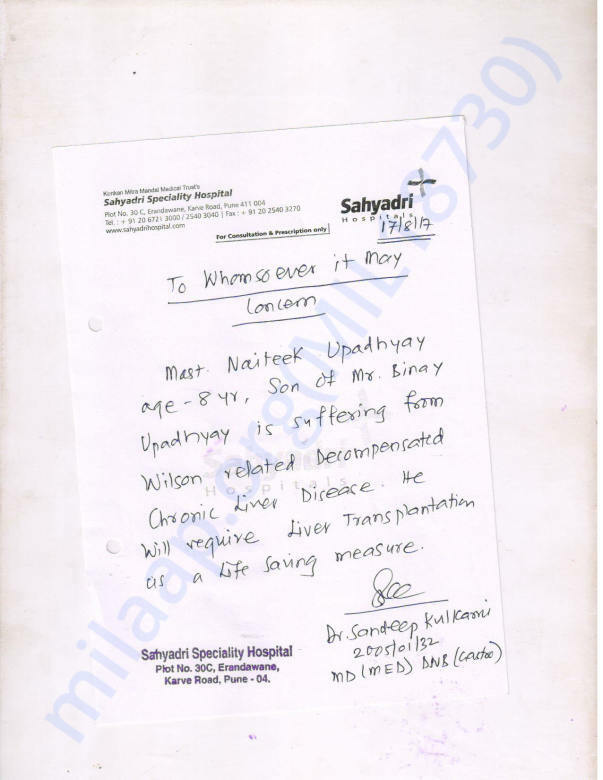 I am Binay Kumar from pune, Maharashtra, my only 8 years old son Naiteek suffering with liver failure disease (wilson’s Disease) due to Copper build up in the liver, brain, eyes and other organs. Over time, the extra copper can lead to organ damage that may cause death. Now he is undergoing treatment at Sahyadri Hospital (Karve road, Pune) for reduce the extra copper through urine but as per doctors if we are continuing the same process to extract copper from body it can damage kidney also. 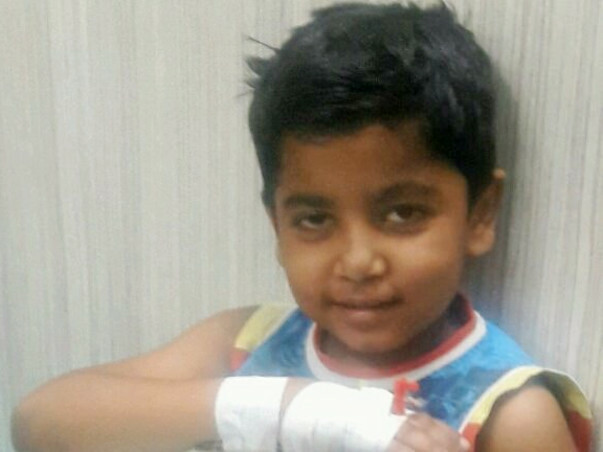 Doctors advised liver to be transplant as soon as possible. The cost around Rs.22,00,000 (Except Donor cost, I am going to donate my Liver) we are taking treatment since last 6 months from multiple hospitals and done different types of test, scan & sonography after every 10 days and it’s still continued to check the reaction of medicine and monitoring the functions of Liver and other organs, his school education also has Stopped for the Treatment. 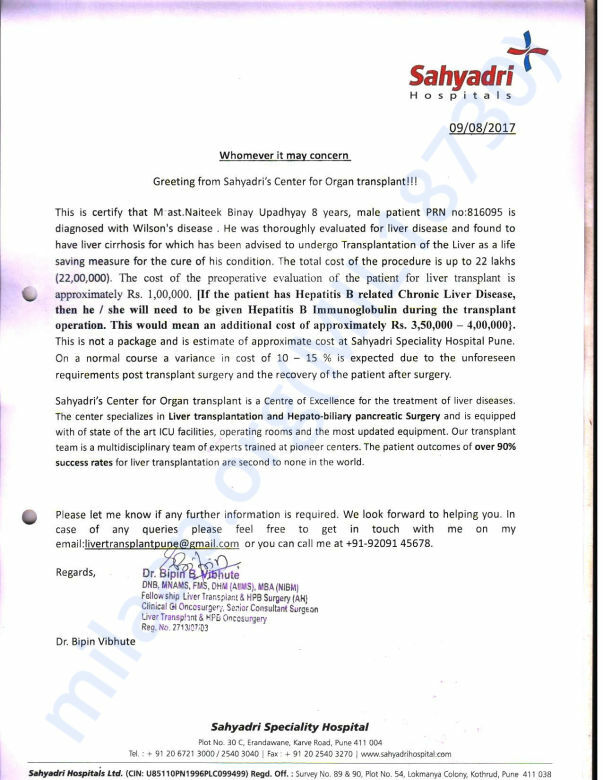 In last six months we spent most of our savings, also after transplant, Rs.30000 per month (Nearly 1 year) are needed for medicines and injections so that the body can accept transplanted Liver, which is out of reach for a person like me who is earning a meagrely from my small Job to meet day-to-day expenses only. I cannot afford the treatment cost as I have already exhausted all my savings on his ongoing treatment. The transplant will be done at – Sahyadri Speciality Hospital, Plot no.30C, Erandawane, Karve Road, Pune-411 004. As it has the team of expert and best doctors for Transplants of Liver, kidney and other human organs. You are free to contact me and check authenticity of my Son’s condition and facts mentioned here (documents attached). I request all of you to donate generously for this noble and human cause, I will always be Indebted to people who donate to save life of my only Son Naiteek upadhyay. Thank you for the support that you have shown towards my son Naiteek. His health was not stable and the doctors were administering him treatment for the same. His eyes have turned yellow and his weight is also reducing. The doctors suggest undergoing the transplantation procedure as soon as possible. 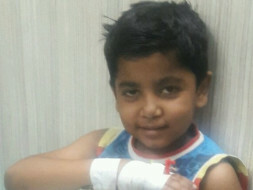 His transplant surgery was scheduled on 6th February but due to his health and other factors, we were unable to perform that surgery. The doctors have rescheduled the surgery to tomorrow (13th February). I will be donating a part of my liver to him. I would like to thank all the donors for all the love and support that you have shown towards my son. Would request you to please share this campaign further with your friends and family to help us in raising funds faster for his treatment. Do pray for his health and speedy recovery. Will keep you posted.